A black comedy that is interesting and funny, the movie does hit some bumps and get slow at times, in part due to a large amount of live music performances. A very dark movie, this one, like nearly all of the coen brothers films, works because of its humor. The story itself is merely about a down on his luck guy, just trying to survive in the middle of a cold new york winter. In many ways this basic premise is similar to one of their better, more recent films, a serious man. 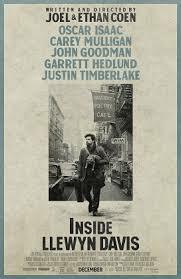 And they manage to turn this genergic yarn of a tale into something creative, by putting the title character, lewyn davis, into some elaborate situations. He’s got all kinds of relationships with other characters, each riddled with its own problems. there’s the girl he knocked up, who is his best friend’s girlfriend, and the older couple who lets him stay over, only to have him yell at their dinner party and lose their cat. There’s a slow moving mid-section, that feels disconnected from the rest of the film, but other than that, this is a pretty good movie. Inside Lewyn Davis is one of the more deep and quiet Coen Brothers movies. these guys are always making smart black comedies and sometimes they are loud and obvious (the Big Lebowski, oh brother where art thou), while other times they are complex and thought provoking (Barton Fink, a serious man.) 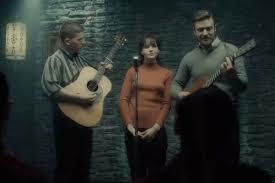 Inside Lewyn Davis is one of those thought provoking times. this is a movie about a guy who is down on his luck (just like in a serious man), only Davis has it worse than the character in that film. much worse. he doesn’t have a penny to his name. that means he doesn’t have a winter coat in Manhattan at the worst time of the year to be without one. he doesn’t even have a place to stay. Instead, he is forced to crash with friends and acquaintances on a nightly basis. at one point, he just meets a guy, (adam driver) plays a song with him, and by the end of the song, is asking if the man has got a spare couch to spend the night on. at the start of the movie we watch davis perform a song at a bar and then go into a back alley where he gets beat up. he wakes up at the home of his friends, the gorsteins, an older couple who has welcomed davis in. on his way out the door, that morning, davis let’s the cat out into the hallway. he goes after it, and the door slams behind him. now davis is locked out of the apartment with this cat. the elevator man refuses to take the cat for him, and so davis has to spend the day with this cat, taking it from place to place. The cat situation turns out to be more than just a small bump in the road. Especially when Davis loses the cat, finds another one which he thinks is the same cat, and brings it to the gorstein’s apartment. that scene caps off a long day of lousy situations that ends with davis yelling at the mrs. gorstein for inviting him to dinner only to force a guitar into his hands and ask him to play for them. he’s angry about that and he’s also angry that mrs. gorstein insists on singing the part of davis’ recently deceased partner, mike. the backstory there is that davis was part of a duo until his partner decided to throw himself off of the george washington bridge. now davis is broke and grieving. he spends one night staying with his friends jim and jean. she thinks davis is the scum of the earth, but jim doesn’t seem to mind him. jim also doesn’t know the truth about davis and jean’s recent past. the two of them slept together and now jean is pregnant. she tells davis that there’s a good chance that it’s his, but she can’t be sure. jean really wants to have a baby with jim. if it’s jim’s then that’s great, only she has no way of knowing, and so she opts for an abortion instead. jean wants lewyn to pay for it. he gets the money by recording a song with jim and al cody (driver), which is the strangest, funniest, and most entertaining song in the movie. just hearing driver make bizarre noises and sing “outer space,” is pretty hysterical. so is watching the way davis reacts to everything in the scene. from asking jim about who wrote the song, to quickly signing over his royalties (because he thinks the song will not make any money), davis is the voice of reason in the middle of this bizarre song. between jean and her abortion, finding a place to stay each night, and searching for the lost gorstein’s cat, davis is dealing with a lot. he also has an elderly manager who hasn’t shown him any money for his records. things really hit a low point when he visits the abortion doctor and learns that the last girl davis brought in there to have an abortion never actually had it. instead, she kept the kid, which means that somewhere in the world, davis has a kid out there. he feels completely betrayed as he heads to the gorsteins house with what he believes is their cat, only to have the night get even worse. it is after all of this, and after davis has hit his lowest point, that he suddenly appears in a car with two very unusual characters. these are roland turner and johnny five. turner (played by john goodman), sits in the back seat and is loud and boistrous when he isn’t passing out in the car. johnny five is the exact opposite. he almost seems like a quiet henchman whose job it is to drive turner around everywhere. this segment of the film moves at a much slower pace than anything that came before it. part of what hurts the segment is that we have no idea who these guys are or what they are doing. we don’t know anything about them other than how we see them behaving in the moment. as the lenghty mid-section of the film goes on, we are able to piece together the fact that these guys are merely men who picked up davis as a hitchhiker, and are driving him cross country. they might be symbolic representatives of something (the death of bebop taking driving davis across the country,) but there’s enough symbolism in the movie even without them, that this part isn’t really necessary. i suppose it serves a purpose, which is to break up the first and second halves, but instead, it kind of takes us out of the movie and loses the films momentum. a serious man had no mid-section like this to serve as an intermission, and was all the better because of it. the symbolism is definitely there in other parts of the film as well. the cat might represent davis’ dead partner, mike, always trying to escape and get out. the gorsteins might be the parents of mike. they were certainly close to him and cared greatly for the man. there’s even a strange ending that book ends the film and makes us look at things that happened earlier on in the movie a little differently. this is a very artisitc and enjoyable film, but there are certainly problems to it as well. the music scenes are mostly dull and uninteresting. and that john goodman midsection is slow and tiring. luckily everything that happens before and after it is pretty great. when davis returns home for the second half, things haven’t gotten any better for him. he now has to jump through a whole set of obstacles just to attain a license. it’s just that kind of movie, about a guy who can’t catch a break. sometimes those movies are depressing, but in the coen brothers’ hands, they know how to play it for humor and get the tone just right.